By Jonathan Azaziah – A calamitous tragedy of immeasurable proportions was averted late yesterday afternoon in Iraq’s Salahuddine. Quds Force Commander Hajj Qassem Suleimani, the Spear of Liberation and Zion’s most hated enemy, had just finished up a long day in the northern Iraqi province. He prayed in Balad–a frequent target of the Takfiri Goy Golem he helped smash to smithereens–at the shrine of Sayyed Muhammad Ibn Ali al-Hadi, the son of Shi’a Islam’s Tenth Imam (A.S.) and the brother of Shi’a Islam’s Eleventh Imam Hassan al-Askari (A.S.), and then met with Sunni tribal leaders and political parties to discuss preserving the unity of Iraq and thwarting future fitnah. As he was getting ready to head to Baghdad before returning home, he noticed black helicopters and drones passing through the skies–a blatant sign of American surveillance. He then signaled to his driver that they should switch vehicles. And sure enough, right as they were walking to an unmarked jeep, the sedan he planned on utilizing to travel to the Iraqi capital exploded in a gargantuan fireball. Hajj Qassem was lightly wounded in the blast–which was brought on by a whopping 1,500 kilograms of military-grade explosives. The IRGC legend’s Mouqawamist intuition–a true gift from ALLAH (SWT)–saved his life. He knew something was wrong upon seeing the US spy aircraft–which incidentally were giving the green light to proceed with the (failed) kill–and took a swift decision to adjust gears. He was right. Iraqi Popular Mobilization fighters led by Harakat al-Nujaba hit the trenches in the immediate aftermath, initiating a large-scale intelligence operation and arresting scores of individuals. Local agents of Saudi Arabia, which has long been paying tribes in Al-Anbar and Salahuddine for information on Iraqi Islamic Resistance groups and the Iranian and Hizbullahi trainers who assist them, were nabbed. They admitted to keeping tabs on the Kerman Knight and subsequently passing that very data to the orchestrators of the assassination attempt: The usurping Zionist entity. Using perfect-English-speaking American Jews from Mossad and Aman, who dressed in American army gear to avoid detection or suspicion as US occupation forces remain an unfortunate reality in Iraq, ‘Israel’ planted bombs in multiple vehicles across Major General Suleimani’s last known location with the view of “quantity equals quality”. By God’s grace however, this arrogant Judaic outlook and the US-‘Israeli’-Saudi operation as a whole proved to be abject failures. Qassem Suleimani lives to fight another day. ALLAHU AKBAR. The maneuver against the Islamic Revolution’s Imperialist-Crippler-In-Chief was a crude and bold one but it most certainly wasn’t shocking. It’s not a secret that the CIA and the ‘Israelis’ have been trying to take out Suleimani for decades. Al-Jarida, a known Mossad dumping ground in Kuwait City, reported back in January that there was an American-‘Israeli’ consensus on removing Hajj Qassem from the regional equation. And this past July, a piece entitled “‘Israel’s’ most dangerous enemy: Who are you, Hajj Qasem Soleimani?” was published in Ynet, the usurping Jewish entity’s most popular online news portal, outlining how much the Mossad and the entirety of the Zionist military-industrial-complex despises the Iranian Master Moujahid. That the drivel was written by Dr. Ronen Bergman and Dr. Raz Zimmit, the two ‘Israeli’ intelligence-connected media muckity-mucks most vocal in the spreading of lies about Iran on an international level, is more than indicative of how desperately Shlomo’s spooks want Hajj Qassem clipped. A prime objective of Mossad indeed. Yesterday’s murder attempt solidifies it in an even more emphatic way. As the aforementioned Ynet piece admits, Qassem Suleimani won’t rest until there’s a Resistance Axis weapons supply line that reaches the criminal colony of “Rosh Hanikra”–or, as it should be called, Ras al-Nakoura, its proper Arabic name–in the occupied Galilee. Which reminds us of Sayyed Hassan Nasrallah’s promise that in the next war, Hizbullah will not only enter Al-Jalil but free it from Zionist control. When Hizbullah’s Secretary-General made this famous announcement, Qassem Suleimani is said to have called him and declared simply, “Whatever you need to make this happen either now or in the near future, you let me know.” Anyone who knows anything about the Quds Force Titan is aware that nothing means more to him than the recapture of Jerusalem. In other words, ALLAH (SWT) isn’t ready to call the Dajjal-Obliterator home just yet. Until Palestine is liberated and Western ZOGs are ejected from our region, Suleimani’s gonna keep working. Keep struggling. Keep slaying Global Zionism and its tools. Insha’ALLAH khair ya Rab. The IRGC’s Mighty Moujahideen aren’t taking the attempt on their best unit’s head honcho lightly. They’ve promised a vicious retaliation. We anxiously and gleefully await it. Riyadh, Washington and “Tel Aviv”, fresh off their slaughterous attack on Ahvaz, messed up big-time with this one. 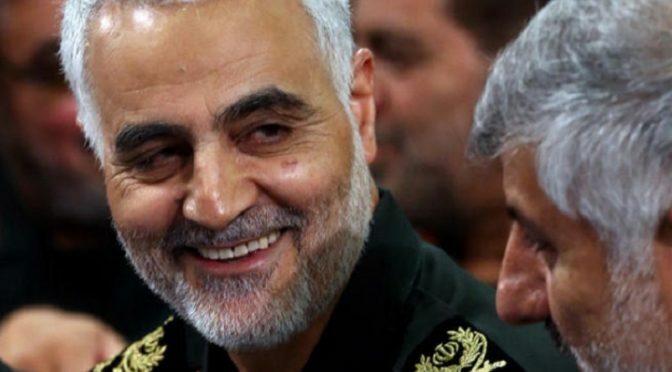 And in customary Suleimani fashion, he ain’t gonna let them sleep even a wink over their folly. May ALLAH (SWT) protect Hajj Qassem from all the devils who wish to do him harm and guide him towards what he desires most: Sending Zion to oblivion.